A revolution is underway, for body hair removal that is virtually painless. The Pain-Free, Hair-Free™ treatment, offered by spas and physicians around the world, can now free you from daily shaving, painful plucking and expensive waxing to give you silky smooth and beautifully bare skin. Pain-Free, Hair-Free is the next-generation of laser hair removal. It's an effective and permanent hair reduction solution that is simple and easy. It takes cutting-edge medical laser technology and combines it with the comfort and convenience of a trip to the spa. In fact, Pain-Free, Hair-Free uses new breakthrough technology that has been described as one of the most comfortable laser hair removal options available. Pain-Free, Hair-Free™ is for everyone. It's safe for all skin types, hair types and most hair colors. It can even be used on tanned skin. The bottom line is – if you have hair where you wish you didn't, Pain-Free, Hair-Free is for you. The treatment process is permanent, predictable, and virtually pain-free. You'll go through a series of office visits to see the full benefits. Pain-Free, Hair-Free uses the most successful photoepilation wavelength (810 nm), which makes it the gold standard for laser hair removal. In addition, a patented DualChill™ mechanism ensures the surface of your skin stays cool and even more comfortable throughout your treatment. Pain-Free, Hair-Free™ breaks the mold of previous laser hair removal systems. The system's unique IN-Motion™ technology, along with the sweeping motion of the laser, safely and gently heats the targeted area under your skin while you stay comfortable. Most people find Pain-Free, Hair-Free very comfortable. While pain tolerance is subjective, many patients often describe the sensation as soothing as a "hot stone massage." Pain-Free, Hair-Free works by using pulses of infrared diode laser energy to gradually heat the hair follicles in the subdermal layer of skin until they can no longer produce new hair. Using unique, IN-Motion™ technology and a patented DualChill™ treatment tip, the surface of your skin stays cool and comfortable. 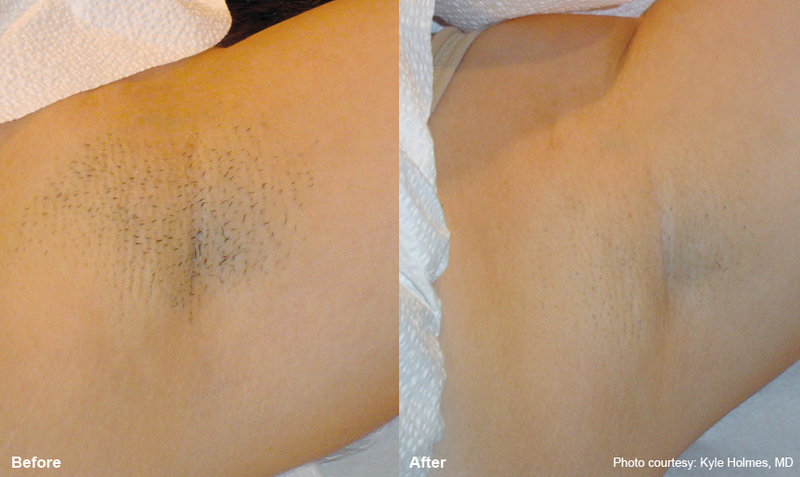 The sweeping motion also eliminates any skipped or missed spots common to other types of laser hair removal. Any medical laser procedure can be a bit intimidating at first. Learn more about Pain-Free, Hair-Free™ here, so you'll feel completely comfortable with the procedure. 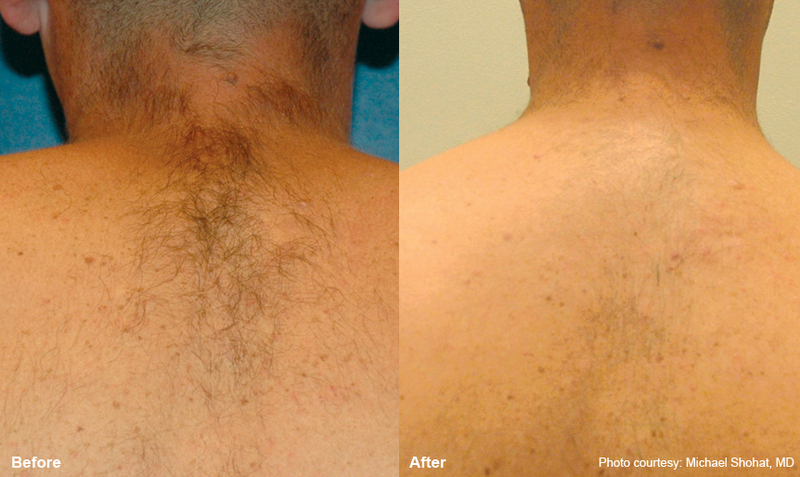 Hair removal is one of the aesthetic medical industry's most well-known and researched uses of lasers. Pain-Free, Hair-Free's Soprano®XL laser has provided permanent hair reduction for thousands of patients worldwide, safely and successfully since it was cleared by the FDA in 2005. There are a number of factors that can affect the success of a series of hair removal treatments, but generally, after each treatment, you'll see a noticeable, permanent reduction in the number of hairs that regrow in the treatment area. Typically, it will require 4 - 6 treatments or more to permanently reduce the number of regrowing hairs by more than 80%, six months after the last treatment. No. Pain-Free, Hair-Free requires no "down time" or recovery time. You can have a treatment and return to work or school immediately. Most people find Pain-Free, Hair-Free very comfortable. While pain tolerance is subjective, many patients often describe the sensation as soothing as a "hot stone massage." If you find it otherwise, talk with your doctor or laser technician. Pain-Free, Hair-Free treatment costs vary by location. Please schedule an appointment at our office and ask for a quotation. Compared with a lifetime of shaving, waxing or plucking, Pain-Free, Hair-Free can be a worthwhile investment in both time and money-savings. "I am very satisfied with my results from my laser hair removal with the Alma SHR system. I recommend it to everyone. Every hairy woman should do it." "Recently I had a first-time client for laser hair removal. She was coming in for hair removal on her lip and was a little nervous about how it would feel. I suggested we try it on her underarm first before proceeding to her lip. We lasered one underarm and then her lip. She was surprised at how comfortable it was to have it done. Today she was back for her second treatment and she said, 'I am so mad at you.' I asked why. 'I can't believe what a dramatic difference that made in one treatment – now I need to do my other underarm.' It is amazing what dramatic results you can get so quickly." "Our clients and technicians love the SopranoXL. Treatments can be performed quickly and safely. The IN-Motion treatment is much less tedious for our technicians. Since we are doing multiple passes, we don't have to worry about missed spots, or double-pulsing our clients. Several clients have described the treatment as feeling like a 'warm massage.' Ellen G., who started treatments with the conventional mode on the Soprano, came in for her third treatment after we had upgraded to the XL, and her comment of, 'Wow, that was way better' sums up general client sentiment to the treatment. The results we are seeing in our clients are equal to or better than those we saw with the conventional method. With the conventional method, clients with low pain tolerance may not have seen ideal results because we were limited in how much energy we were able to treat them with. The SHR mode on the SopranoXL takes pain out of the equation and allows everyone to get an effective treatment and excellent results." Call us at 416-398-0111 to book your complimentary consultation and Try it for free !!! We also provide 0% Financing for certain packages*.